In celebration of our love for cooking, we are sharing mouth-watering recipes with you. There’s no limit in what you can whip up in your kitchen when you have Chef’s Classics cookware. For our first dish, gather the following ingredients to cook a classic favorite among Filipinos. 1. Cook the meat by boiling it in water. Once done, set aside the broth. 2. Put the noodles in water. 3. In a pan, sauté garlic and onions. Add the meat, shrimp and Chinese sausage after. 4. Mix in green beans, carrots, cabbage, snow peas and kintsay or cilantro with the meat. Continue stir-frying until the vegetables are half-cooked. 5. Pour fish sauce then, remove from heat. Set aside. 6.. Using your Chef’s Classics Daisy Plus Wok, simmer soy sauce and broth. Put in noodles and cook for 3 minutes. 7. Mix together with the cooked vegetables. 8. Add salt and pepper for seasoning. 9. 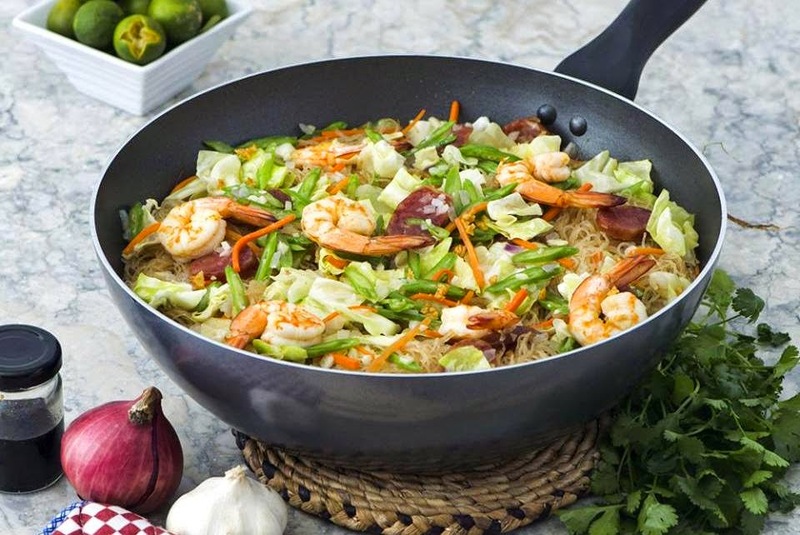 Serve your plate of pancit with calamansi or lemon.